BBC NEWS | South Asia | Sri Lanka - talks or war? 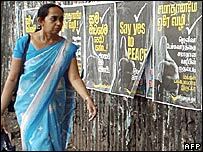 Sri Lanka - talks or war? 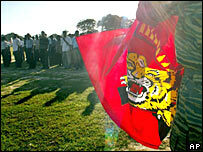 Sri Lanka is either on the brink of conflict or on the way to Geneva for another round of talks to resolve its civil war. No one knows for sure yet which way it is heading. There are optimists here who say there is a possibility talks will go ahead - but they are hard to find. An initial round of negotiations in Geneva in February was meant to halt the escalating violence that marked December and January. The talks were significant because it was the first time the government and the Tamil Tiger rebels had met since the peace process stalled in 2003. They were aimed at strengthening a fragile four-year-old ceasefire. The talks scheduled for 24 April were meant to be about how that implementation has worked. However, in the past week more than 60 people have been killed in daily attacks. The military are being targeted but last Wednesday for the first time we saw civilians being attacked. 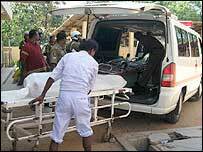 A market bomb in the eastern town of Trincomalee killed 16 people. The government blames the Tigers; the Tigers issue their standard denial. Few here believe them. The bombing led to communal violence, Tamil homes burnt by Sinhala extremist mobs. Some 200 people have now left their homes and are sheltering in schools and churches. There have also been incidents of abductions and disappearances of Tamils continuing in the north in government-controlled areas. It is hard to see how exactly, if the talks do go ahead, they can talk about implementation of the ceasefire since February given this escalation. They will be starting from square one, trying to secure guarantees just to keep the situation in a holding pattern of relative peace. On paper this truce is in place, on the ground it is a different story. However contemplating the island without a ceasefire is worrying. "At least now there's the international truce observers, the Sri Lankan Monitoring Mission," says Rohan Edirisingha of the Centre for Policy Alternatives think tank in Colombo. "Without a ceasefire, however ragged, the situation would be worse, it would be no holds barred." The ostensible reason for the talks being in limbo is the insistence of the leadership of the Tigers in the north of the island to first meet their commanders in the east, which involves crossing government-controlled territory. They have said they will not go to Geneva until they have met their regional leaders. Transportation issues have stalled this movement. International efforts are trying to resolve them. However, among analysts and the international community here there is a deep scepticism that this is the only reason. The Tigers are known for using brinkmanship to try to push the other side into concessions. Some here see the transportation issue being used as a delaying tactic to avoid going to Geneva. The Tigers have a de-facto state now, albeit one that is divided. Any settlement based on granting them autonomy in areas they control now might seal those borders forever, quashing their dreams of a united, and also larger, independent homeland. The violence blamed on the Tigers is perceived as a strategy to force the government's hand. No one believes either side wants a return to all-out war. The government cannot afford it, although there is speculation that elements within the administration believe the army could militarily defeat the Tigers and perhaps war would provide a final resolution. 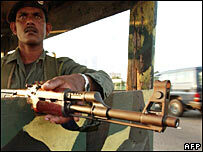 The Tamil Tigers may push but the thinking is that an all-out conflict would not suit their purposes. The break-away rebel faction led by Colonel Karuna, which left the Tigers in March 2004, has been a constant thorn in their side. It has undermined their power base in the east and their claim to be the sole representatives of the Tamil people. The Tigers accuse the government of allowing Karuna's faction to operate in the government-controlled areas and provide them with support. This is a claim the government denies, but again few here believe that denial. This is seen as the crux of the real issue. Diplomats and analysts say that as far as the Tigers are concerned, until there is visible action against the Karuna group they are reluctant to move forward within talks. However working on the philosophy, my enemy's enemy is my friend, analysts say it would be foolhardy for the government to take any action against Karuna. So Sri Lanka carries on with neither peace nor war. Talks can at least open the way for dialogue and keep a shaky ceasefire in place, but ultimate stability rests with a belief that both sides really want it.